The girl group Pajama Party had brief success on the dance charts in the late 80s. They only recorded two albums so they weren't around very long. They recorded Freestyle music which was a mix of R&B, dance and salsa that originated in New York's Latino community in the mid 80s. Expose was probably the most successful Freestyle act. 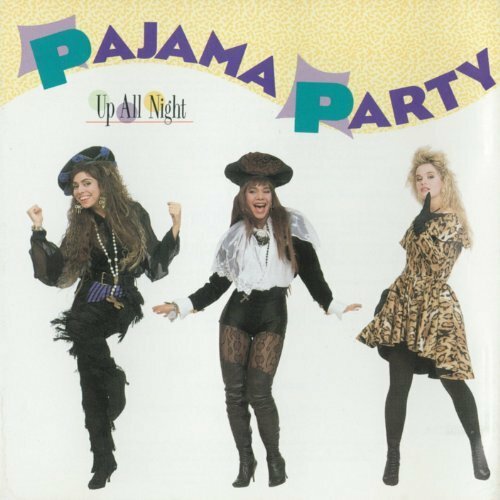 Pajama Party was formed in 1986 by recording engineer Jim Klein and his songwriting partner Peggy Sendars. The members of Pajama Party were Daphne Rubin-Vega, Jennifer McQuilkin and Suzi Ranta. They signed with Atlantic Records and their debut album Up All Night was released in 1989. Yo No Se was one of three singles that were top 20 dance hits. Jennifer sings lead on the song. Jennifer and Suzi were replaced by Lynn Critelli and Amanda Homi and then Amanda was replaced by Maraliza Costanzo. The 1991 album Can't Live Without It didn't do well. Pajama Party split up in 1992. Up All Night is available as an mp3. Daphne Rubin-Vega went on to a Tony nomination as Mimi in the Broadway show Rent. She still performs on Broadway. Jim Klein went on to compose music for commercials and he won Daytime Emmys for his music for the soap All My Children. A version of Pajama Party was formed in 2000 and it looks like they still perform in the New York area. Here's Pajama Party performing Yo No Se on the 80s TV show Dance Party.